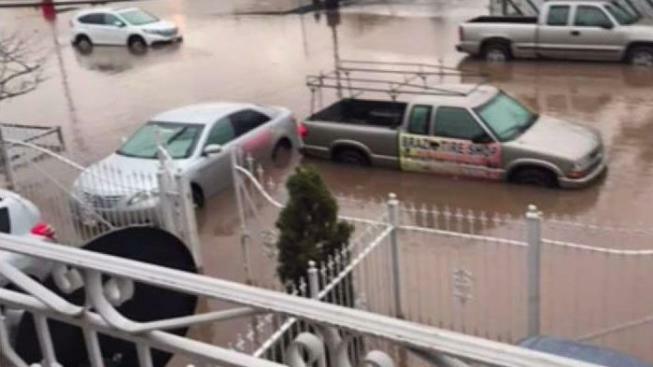 A broken water main in Newark flooded homes and businesses after an overnight storm Monday. Jen Maxfield reports. A massive water main break is submerging Newark in water so deep it’s nearly drowning cars and some businesses. The break burst on Park Avenue around 5 Monday morning and the flooding in the area was all due to the break and no the weather from the storm that pounded the tri-state with inches of rain and howling winds that toppled trees and left thousands of people in the dark. Officials have North Seventh Street all the way down to North Fourth Street blocked off to traffic and Newark Light Rail service is temporarily suspended in both directions between Orange Street and Bloomfield Avenue due to the flooding. Video from the scene shows a flooded area with local businesses and cars on the street beginning to be swallowed by the water. A massive water main break is submerging Newark in water so deep it’s nearly drowning cars and some businesses. Tracie Strahan reports. It’s still unclear what triggered the break.